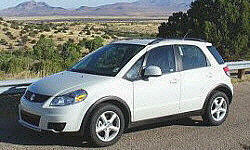 Why the 2008 Suzuki SX4? Interior and cargo space are roomy for a compact car. Lots of head & leg room for front and back seats. Easy to get in and out of front seats. Trunk is big. For a small car that's easy to park there's plenty of interior space. Fuel goes a lot further than the mid-size car the SX4 replaced. This is a very peppy car with great brakes. Handles well and takes bumps pretty good. GPS put us on a snowmobile road in Vermont in the summer but I wouldn't do that again. Trunk is suprisingly large for a small car. 58,000 miles and no problems yet. Why Not the 2008 Suzuki SX4? The front windshield frame creates blind spots for traffic coming from intersections. It took me a year to get used to leaning forward to double check cross traffic. The blind spot swallows entire SUVs which are only 40-50 feet away on both left and right sides. When following another car turning left in an intersection you will completely loose site of that car momentarily so keep your distance. This is the only car I've owned that planes on wet roads multiple times. Replaced the standard Dunlap tires which came with the new car (and only had 25K miles on these) for Tiger Paws which didn't do well on snow. Have Goodyear Triple Tread now which are quieter and ride better but I haven't tested on highway with rain. Road noice is apparent although not as bad as some other cars. The SX4 is easy on the budget and easy to enter and exit without hitting your head or feeling like your'e dropping to the floor. I would not want a new driver, young and inexperienced to drive this due to the blind spots front left and right. The small side front windows are meant to improve visibility but are only helpful if you are very short.